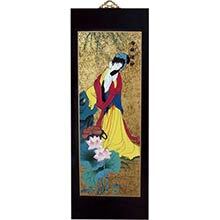 A Chinese princess decked in colorful robes lights incense in this amazing work of Asian artistry. A yellow sun can be seen in the upper right of this work while a gold background lends an exotic effect touch to the work. 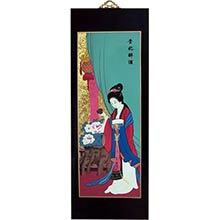 A Chinese princess decked in colorful robes lights incense in this amazing work of Asian artistry. A yellow sun can be seen in the upper right of this work while a gold background lends an exotic decorative effect to the work. 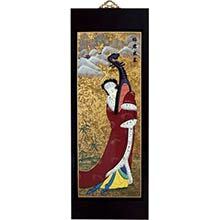 This nearly two-foot tall piece will make the ideal artistic addition to any wall in your home. Limited quantities available.